​The Rick and Julie Pierce cabin is located on the north side of the lake, 2 lots east of the Pinecrest Resort (the dock with the streamers and the Minnesota and pirate flags). They have been on Bass Lake for 10 years. When they bought the cabin in 2008, they had 30 feet or more of beach. Over the years as the lake has risen, more ice damage and wave erosion has eroded the shoreline to the point where their lakeside trees are now in serious jeopardy with exposed tree roots and lakebank undercuts. On July 28, they did a lakeshore restoration project working with Shelley Larson from Hayland Woods. 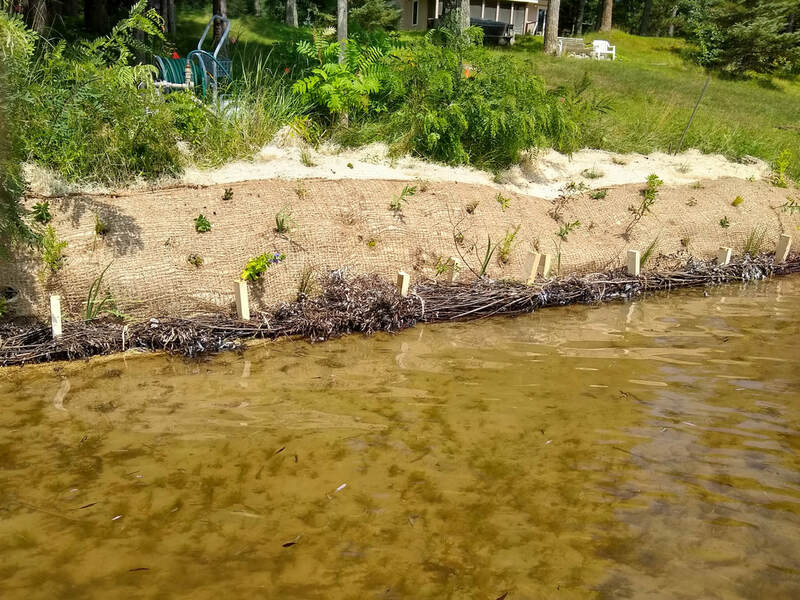 The project involved installation of a jute erosion blanket, willow wattle bundles with emergent plants, and several upslope native plant gardens to slow runoff into the lake. They received a grant from Crow Wing Soil and Water Conservation District to cover half of the cost of the project. Hi! I'm John Carlson Bass Lake Association Vice President. Marilyn and I purchased our property in 1990 from Alden Norwood. The cabin was a 24X40 garage. Over the years we've built on two additions and a garage to make our cabin into our year round home. I grew up on a farm near Canby, Minnesota. I met Marilyn roller skating in Gary, SD. The rest is history. We will be married for 50 years in 2017. We lived in Mt. Lake, MN for thirty years. Marilyn taught first grade. I worked for the postal service. We retired in 2006 to Bass Lake. We spend the winter in Mesa, AZ. We enjoy line dancing, swimming, playing cards, the wood shop, jam feats and sitting in the sun. We also volunteer at the Arizona Museum of Natural History in Mesa. Instead of taking the car to "town". We often use the light rail to go to Phoenix. Camping brought us to the Cross Lake area. Our first cabin was on Fawn Lake and then we found Bass Lake. 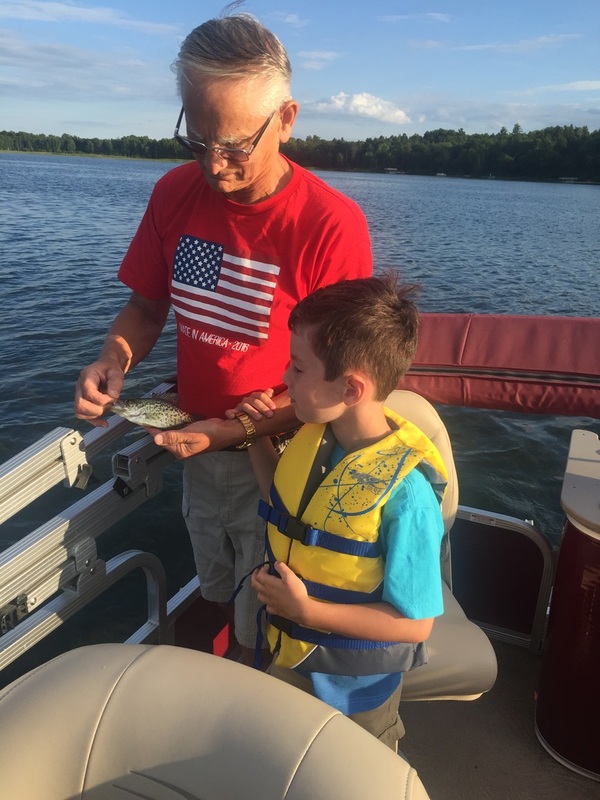 Some of our favorite activities to do on Bass Lake are: pontooning around the lake with Marilyn Bloom to check up on the loon families; crappie and sunfish fishing with grandson Peter and kayaking. We enjoy the serenity of the Lake and the beautiful view. Marilyn and I enjoy belonging to the BLA. It has been a wonderful way to meet other Lake residents. We also like to be aware of ideas to help keep Bass Lake free of Aquatic Invasive Species. It is our hope that we can work together to keep our Lake healthy. Our daughter Kari lives in Rochester with her husband Paul and our 7 year old grandson Peter who enjoys visits to Bass Lake. Hello, we are the Auge’s and would like to introduce our family to the Bass Lake family. Jon (Supply Chain director for 3M’s Consumer business) and Julie (day care for her niece and nephew) both retired on June 1 and moved full time to Bass Lake from Cottage Grove. Together with our two dogs (Allie - 12 year old golden retriever and Althea - 7 month yellow lab) this is our up north family. In September, we will celebrate 33 years of marriage. We are frequently joined by our four children and son-in-law, Andy (Buffalo Wild Wings corporate) Ashley (Twin Cities Orthopedics) & Frank (self-employed plumber) AJ (Merwin Drug) and Adam (College student). Julie was born in Crosby and has many relatives in the area (Bjerkness and Katzenberger). We were already familiar with the area due to frequent visits and having vacationed at Boyd Lodge for 15 years. We looked for 2 years and finally landed on our new home last Memorial Day. We just celebrated our 1 year anniversary on Bass Lake. For fun and relaxation we enjoy fishing, walks, cards of all kinds and home projects. Julie is into crafts including stained glass and mosaic pottery. We just spent a year finishing the basement and remodeling the upper level of our new home. Finally have a dock and pontoon to enjoy the lake. We look forward to getting to know our new neighbors.